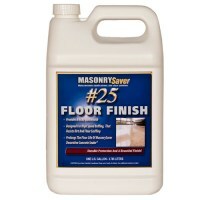 MasonrySaver® #25 Floor Finish is formulated to be applied directly over MasonrySaver® Decorative Concrete Sealer, providing a rich, gloss finish that resists dirt and floor scuffing, and prolongs the floor life of Decorative Concrete Sealer. 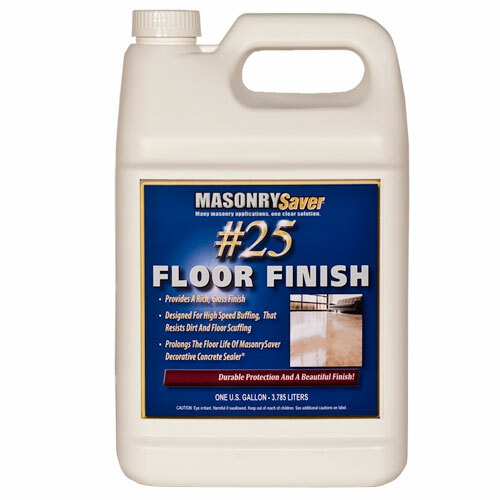 MasonrySaver® #25 Floor Finish has been formulated for use on interior horizontal concrete surfaces. Surface and air temperature should be between 50°F and 90°F. Do not apply to surfaces that are damp or wet. New floors should first be properly cleaned, stained and sealed per manufacturer’s directions. When sealing, use MasonrySaver® Decorative Concrete Sealer, or a comparable product. Allow sufficient time for sealer to properly cure prior to applying #25 Floor Finish. Strip floors thoroughly to remove old wax and floor finish. Rinse floor thoroughly with clear water and allow to dry. If sealer coat has broken down to an uneven finish, reseal the floor using MasonrySaver® Decorative Concrete Sealer prior to applying #25 Floor Finish. Daily sweeping and dust mopping is critical for any floor care program. Damp mop with a neutral cleaner to remove dirt and other surface contaminants prior to buffing. MasonrySaver® #25 Floor Finish can be high-speed buffed to achieve a rich, high gloss finish. A maintenance coat of #25 Floor Finish should be applied when the floor begins to exhibit an uneven sheen. For reapplications, three coats of finish should be applied to traffic areas and a single coat of finish should be applied in non-traffic areas.